» Get awarded for listening! One of our favorite app features is the My Achievements tab. Diligent listeners know how satisfying it is to say the number of books we’ve enjoyed or to know the cumulative amount of days we’ve listened. The My Achievements section will track all of this for you and more! 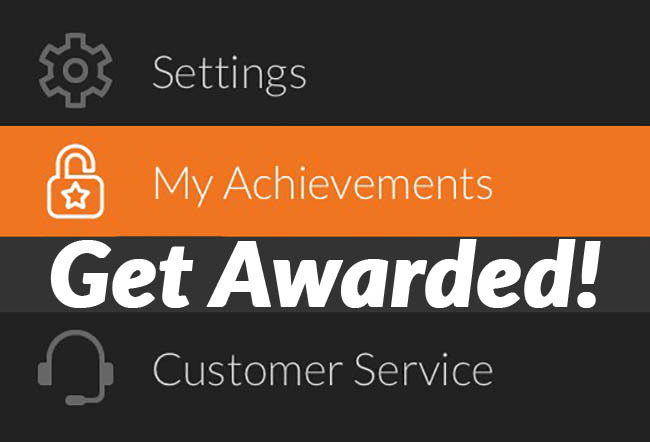 We automatically track your progress and award fun badges for certain tasks. Did you listen all weekend? Have you listened to lots of book series? See how many achievements you can earn! Click the three bars in the upper right corner. A menu will appear on the left-hand side of the screen. Scroll down to My Achievements. Within the My Achievements section, there are three options to choose from: My Achievements, My Info, My Stats. For each of the achievements, on the right-hand side it indicates what you need to achieve for your next star. Once you’ve collected all three stars, you have earned the achievement! Crammer – This keeps track of how many audiobooks you add to your library. To get it, download a certain number in under a month! Diligent Member – This is the easiest accomplishment to achieve. Simply follow the instructions in the My Info tab to edit your profile and voila, you have achieved a goal! Collector – This is considered one of the trickier achievements because it tracks how many titles you’ve accumulated in your library since you began your subscription. How many can you collect? Serial Listener – This keeps track of how many individual series you have listened to. For it to count, you must listen to at least three books in the series. The first star only requires one series, so get listening. Critic – Loved a specific audiobook or narrator? Rate the title and write a review. The more reviews you write, the closer you get to earning another achievement. Loyalist – This is our thanks to you for being a loyal member! It records how many consecutive days you have been a member for. To get the first star, you only need to be a member for 180 days. Good Listener – This is one of the most challenging achievements. It tallies all your listening sessions — the top tier requires 1000 hours (over a month) of listening! Notetaker – As you’re listening, leave as many bookmarks and notes as possible to earn your achievement. You only need to leave three notes for the first star. Weekender – Earn this achievement by listening on as many weekends as possible. For a weekend to qualify, you must listen on both Saturday and Sunday. There are two parts to this section. First off, there’s your basic contact information which you filled out when you signed up. It will also display your account status and when your next credit is arriving (AKA when you may listen to your next audiobook). Next, we want to get to know you! Tell us your birthday, gender and favorite place to listen. You’ll instantly be awarded with the “Diligent Member” achievement. This section keeps track of your basic stats; the number of titles in your library, your cumulative listening time and how long you’ve been a member. Can you make it to a Tier 3 customer by accumulating over 100 titles? Challenge your friends and family to see who can get there first! You already love listening, so why not get awarded for it? This entry was posted in Tips & Tech and tagged audiobook, audiobooks, Awards, My Achievements by Christine. Bookmark the permalink. Are you awarded extra book credits once you achieve 3 stars?